Why choose between a pin and a pendant when you can wear one item both ways? This MACUSA Pendant Pin comes with a sturdy antiqued brass chain and pin back. 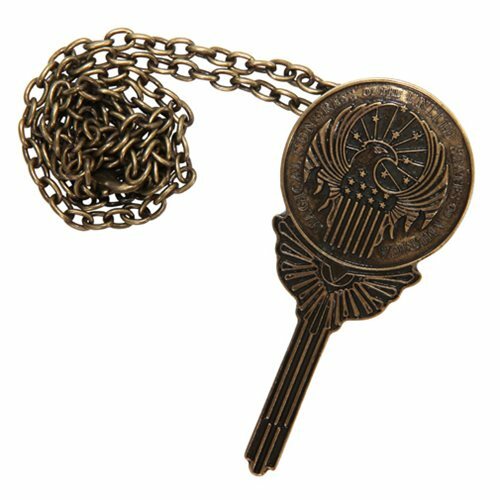 The Fantastic Beasts and Where to Find Them MACUSA Pendant Pin has seal of the Magical Congress of the United States of America. The seal features the eagle, stars, and stripes artwork featured in the movie Fantastic Beasts and Where to Find Them. Excellent choice for everyday cosplay or as a fashion statement. Makes a great gift for fans of J.K. Rowling's Wizarding World! This Fantastic Beasts and Where to Find Them MACUSA Pendant Pin comes with a sturdy antiqued 24-inch long brass chain and pin back.